Nukuria (pop. 500) is a Polynesian language in Papua New Guinea. 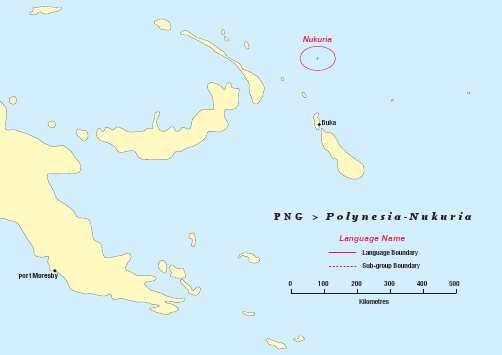 The language is closely related to the language of Takuu, but also has many links to Kapingamarangi in the Federated States of Micronesia. There are no dictionaries or grammars published in the Nukuria language. In August 2010 Isles of the Sea coordinator Nico Daams and Takuu translator Tom Puaria met with a group of Nukuria men and women to discuss the translation of the Bible into their language. Tom explained the process and what is involved. We made it clear that the responsibility for this project will be theirs, but that we will offer our services as advisors free of charge. Because the language is closely related to the Takuu language, Tom will be their translation advisor, and help the project along with the expertise he has gained as one of the two translators of the Takuu New Testament. Nico will be mentoring Tom and assisting the Nukuria project. Currently the Nukuria community is in the process of setting up a translation committee and beginning a fund raising drive to support their translation project. On Saturday 8 September, David Paukie (60), chief of Fead Island (= Nukeria atoll) and one of the main translators of the Nukeria NT, passed away in the Buka Hospital. He lived to see and experience the joy when the Nukeria Gospels were published a short while ago. This month the Nukeria people received the first book ever to be published in their language: the translation of the four Gospels. It was received with great excitement and interest. When the Nukurua translators were not able to attend the second part of their training in Buka, advisor Tom Puaria decided to organise the course on the island itself. Translators from the Nukuria, Nukumanu and Takuu groups, three Polynesian groups in Papua New Guinea, attended the Translation Training Course in Buka. While the Nukuria translators have just started translating the New Testament, the Nukumanu and Takuu translators started working on the Old Testament. Nukuria translators Gideon Wamba & David Paukie have started translating the Gospels into their language.